This recycled plastic Capital Smokers Urn is convenient, lightweight and portable. The architecturally inspired square column design provides smokers with a safe place to extinguish and dispose of cigarette butts. The highly durable polyethylene construction exceeded in the long term weatherability (UV8) and environmental stress and crack resistance (ESCR) testing and is exceptionally rated to withstand erratic conditions. 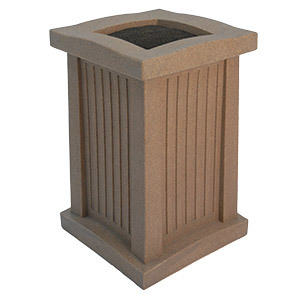 This lightweight, durable smoker's urn can easily be moved from location to location as volume fluctuates. Select textured color options and matching recycled plastic receptacle is available to ensure your facility remains neat and inviting.